As seen on our pages we run a lot of different retreats, but mainly yoga and meditation. 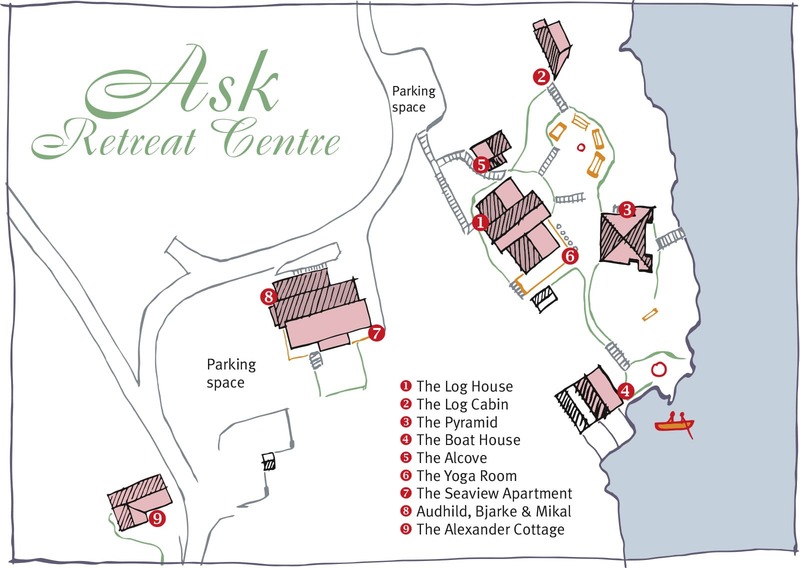 If you and/or your company/organisation are looking for facilities like Ask Retreat Centre it is possible to hire/rent the place. At the bottom of this page is a Calendar with an overview of which days/dates are available. The Log House is the centre’s main building. It is a hand made timber house built in 1994 and includes: Modern kitchen with gas stove and 2 large refrigerators, cosy living and dining room with fireplace, large south facing terrace for eating outside in summer, toilet and bathroom and 3 bedrooms with respectively 2, 2 and 1 bed. The Yoga Room (in the basement the Log House) is about 50 square meters. It can be used for a maximum of 14 people in all forms of activity + the teacher. Both the pyramid and the yoga room has pine floors (with water-based floor heating), futon yoga mats, (sticky-mats available), woollen blankets, meditation cushions and good HI-FI systems with a setup to use iPods and similar. The yoga room also offers a Home Cinema 7.1 system with projector and a 120” big screen. The Pyramid is about 36 square meters and built exactly as a downsized version of the The Great Cheops Pyramid of Giza in Egypt. A maximum of 14 people can sit in the room / 9 people can do yoga and similar + the teacher. The Sauna in the basement of the Pyramid will be available during the retreat. Here are two showers and a toilet as well. The Log Cabin (by the sea) can accommodate 2-3 persons. Bio-toilet and shower. Mini kitchen with stove and refrigerator. The Boathouse (by the sea) can accommodate 2 people, but is also used as a single room. Toilet and shower. The Alcove can accommodate 1 + 2 = 3 persons. The 2-bed room can also be used as a single room. Sink in both rooms. Bio-toilet and not shower (please used the shower in the Pyramid). The Seaview Apartment is a brand new 50 sqm apartment which is just above the Retreat Centre with a private garden and a terrace overlooking the fjord. It is a 2-bedroom apartment with kitchen, 2 bedrooms (1 single and 1 double room), toilet/bathroom, living room with TV (Netflix, HBO mm) and Wi-fi. In the living room, there is also a sofa bed so that there are 3 beds in all. The apartment is typically used by the course leader(s), but can also be used for the accommodation of the students if the course leader(s) want to stay in the Log Cabin, for example. Overview of available days for hire are marked in green. Each bed has duvet and pillow, but the participant brings his/her own linens and towels. It may be rented for NOK 110 (approx. EUR 12) per set. 1. 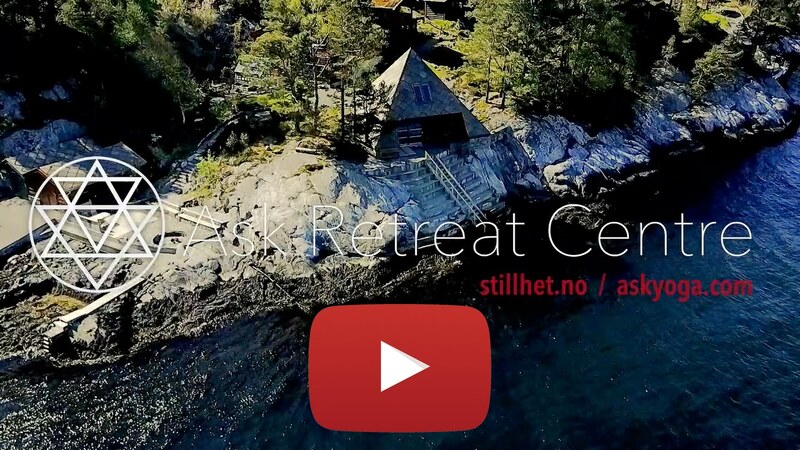 Rent of Ask Retreat Centre: It costs NOK 400 (approx. EURO 41) per participant per day in a double room or a tree beds room. This also covers accommodation for one – 1 – leaders/staff, if there are less than 10 participants and for two – 2 – if there is more than 10. If there are more employees, you must pay the accommodation for them. You pay for minimum 6 – six – people, and you pay for everybody participating in the course whether they are staying the night or not. Single rooms: We have only two real single rooms. If you want to use some of the other rooms as single rooms we recommend using the double room in the Alcove and/or the room in the Boathouse. Eventually charging extra for single rooms is up to you. 2. Cooking: The food must be vegetarian. You can either arrange all cooking yourself as there is a good grocery store (Spar) 1 km from the Retreat centre or we can hire a chef who will make delicious – and organic if possible – vegan food for breakfast, lunch and dinner. a) If 2-3 of your students helps the chef in the kitchen one - 1 - hour each day before lunch and the students do the cleaning and dishwashing after each meal that will cost you NOK 500 (approx. EURO 52) per person per day. b) If we need to hire an assistant to do that (and help the chef as well) it will cost you an additional of NOK 200 (approx. EURO 21) per person per day, total NOK 700 (approx. EURO 72) per person per day. It is also payable for the leader and staff. 3. Waste: We have extensive recycling practices/composting which you have to follow. 4. Cleaning: Throughout the Retreat, you and your group are responsible yourselves to keep the yoga rooms, pyramid, sauna, dining room, other common rooms and the individual rooms clean. At the end of the retreat, you can get a list by which everybody is cleaning their room and the common rooms. If we are going to do the cleaning of the centre after the retreat, the price is NOK 1.500 (approx. EURO 155). There are no transfer services from the airport. Taxi from the airport is around NOK 700 (approx. EURO 72). Upon reservation, you pay NOK 1.000 (approx. EURO 103) per day for the retreat you want to book. The reservation fee will be deducted from the total amount to pay – but will not be paid back in case you have to cancel the retreat. Weekend Retreat: (from Friday evening, 5 pm to Sunday evening 5 pm). Reservation cost: NOK 2.000. (approx. EURO 207). 5-days Retreat: (from Tuesday evening, 5 pm to Sunday at noon). Reservation cost: NOK 5.000. (approx. EURO 516). 10-days Retreat: (from Wednesday evening, 5 pm to Saturday at noon). Reservation cost: NOK 10.000. (approx. EURO 1,033). At Ask Retreat Centre we have had many different kinds of Retreats - mostly yoga and meditation - but also Zen-meditation, Mindfulness Retreats, Creative Painting Retreat and Actre Retreat has been conducted with good feedbacks. The most popular round trip in Norway is called 'Norway in a Nutshell', a one day trip which starts and end in Bergen. When you have decided the date we can put it on our webpage for free. That is a short information and a link to your web page. If you want further information about your retreat on our site, we charge you NOK 500 (approx. EUR 64) to set it up and you must supply us with text and images. As a free service, one of us will guide you and your group – if desired – on a two-hour walk to the nearby hilltop The Queen199 meters above sea level with an amazing view of the whole island and the north sea in the west. As we are long experienced teachers in classical yoga, deep relaxation and meditation it may also be possible to hire one of us for one or more classes in either a program of yoga, 1-2 hours (included yoga asana, breathing exercises and a deep relaxation) or a deep relaxation/meditation, 30 min. It cost NOK 1.000 (approx. EUR 128) per hour. We happily give you and your group a free half hour introduction to yoga and meditation.